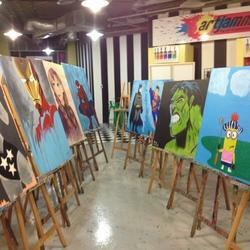 Some people jam music, but at Artjamming™ you jam art! Whether it’s playing, painting, sponging or spraying, it’s about putting on an apron to face a blank canvas and unleashing your own individual creativity that makes Artjamming™ the most fun you can have with a paintbrush. Artjammers are provided with a menu of 12 different size canvases, easels, a choice of non-toxic acrylic paints on tap, brushes and tools to freely express themselves. Various mediums of art to indulge in! For all ages- artists, art students and art enthusiasts Artjamming™ is a great resource, not only for the various art materials available for sale, but also because for as little as R135.00 you can create your own art piece without having to carry the cost of buying expensive materials needed for projects, exams or portfolio examples. With a buffet of colours to choose from, a variety of drawing materials, different tools, paint brushes in all sizes and even a hairdryer to create special effects or speed up the drying process, Artjamming™ can become your own studio in an environment which oozes creativity. 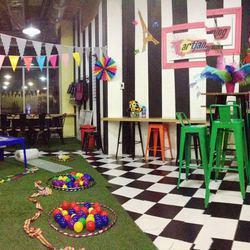 Artjamming has also introduced Messy Play Classes in stores. ARTJAMMING Messy Play offers an outstanding opportunity for children to grow and learn. Young children of all ages can enjoy and benefit from messy play. Infants and toddlers may simply explore the materials and enjoy textures and smells. ARTJAMMING Messy Play helps children to develop concepts. These concepts are the basis for later learning. 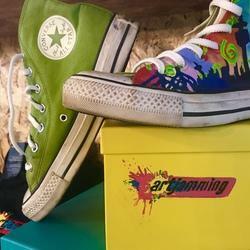 We now offer a mobile division - bringing artjamming to you!